When you build your add-in, if you plan to publish your add-in to AppSource, make sure that you conform to the AppSource validation policies. For example, to pass validation, your add-in must work across all platforms that support the methods that you define (for more information, see section 4.12 and the Office Add-in host and availability page). The following figure shows an example of a Word add-in that runs in a task pane. You can use any web server technology to host your Word add-in, such as ASP.NET, NodeJS, or Python. Use your favorite client-side framework -- Ember, Backbone, Angular, React -- or stick with VanillaJS to develop your solution, and you can use services like Azure to authenticate and host your application. 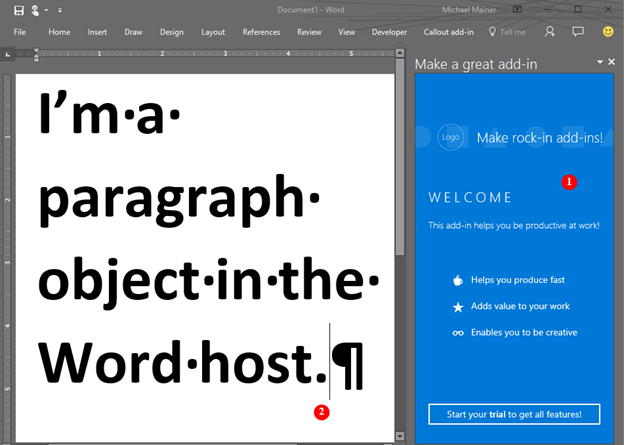 Write your add-in once, and it will run in all versions of Word across multiple platforms. For details, see Office Add-in host and platform availability. Access the objects in a Word document. Perform initial actions for the application. Check the supported requirement set. Access metadata, settings, and environmental information for the document. Bind to sections in a document and capture events. Ready to create your first Word add-in? See Build your first Word add-in. You can also try our interactive Get started experience. Use the add-in manifest to describe where your add-in is hosted, how it is displayed, and define permissions and other information. To learn more about how to design a world class Word add-in that creates a compelling experience for your users, see Design guidelines and Best practices. After you develop your add-in, you can publish it to a network share, an app catalog, or AppSource. What's coming up for Word add-ins?